NEW YORK (WABC) -- July is National Ice Cream Month, so that means only one thing: celebrating America's favorite dessert! If you haven't yet, don't fret because there's still time this month to appreciate the delicious frozen treat. In honor of the month-long celebration and summer, Ample Hills Creamery has offered a challenge to anyone ready and willing to savor a lot of ice cream. Anyone who makes it to all seven of their New York City ice cream shops between now and Labor Day will receive their seventh scoop free. But if you're feeling a little bolder, Ample Hills will offer a free scoop and additional swag to anyone who visits all seven locations in a single day. With the Brooklyn-based creamery's locations spanning from the west side of Manhattan to the Rockaways, you can enjoy some delicious ice cream in seven unique and vibrant areas of the city. 1) Grab a pretzel cone with your favorite ice cream flavor after having a bite to eat from one of the many food vendors at Gotham West Market. 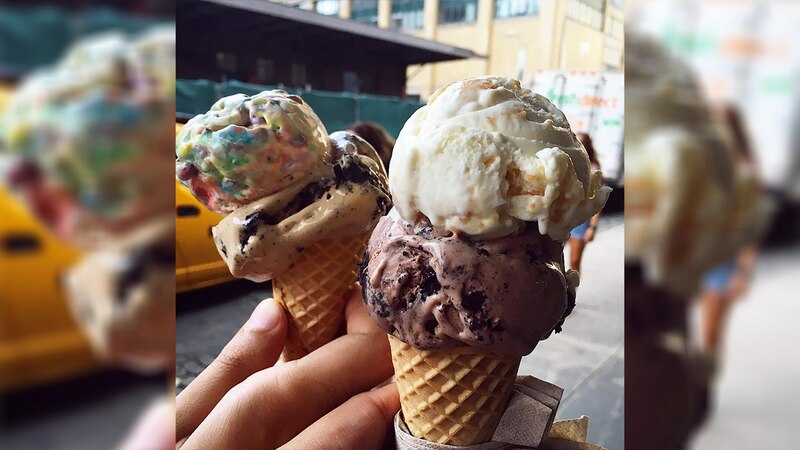 2) Try enjoying a scoop of ice cream in a chocolate chip cone while you're strolling along the High Line. 3) Take in the magnificent NYC skyline from Brooklyn Bridge Park with a collection of flavors in your cup. 4) Feel the breeze from a roof deck in Gowanus as you're enjoying the perfect scoop. 5) If you're truly in the mood for dessert, try a triple stack of scoops as you're walking along Vanderbilt Avenue in Prospect Heights. 6) Bring your appetite to DeKalb Market Hall in Brooklyn, NYC's newest culinary hotspot, and top off your visit with a frozen treat. 7) Catch some sun and ice cream in a classic waffle cone while on the beach at Jacob Riis Park in the Rockaways. For more information, go to https://www.amplehills.com/.